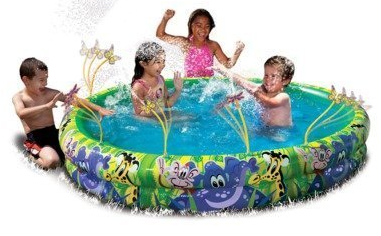 Banzai Spray N Splash Jungle Fun Pool Only $14.99 PLUS FREE Shipping with Prime 50% Off! You are here: Home / Great Deals / Amazon Deals / Banzai Spray N Splash Jungle Fun Pool Only $14.99 PLUS FREE Shipping with Prime 50% Off! Summer is starting to heat up and that means it’s time to find ways to keep the kiddies cool! They will have a blast this summer in the Banzai Spray N Splash Jungle Fun Pool for Only $14.99 PLUS FREE Shipping with Prime! It is down from $29.99 so that is a 50% Savings!